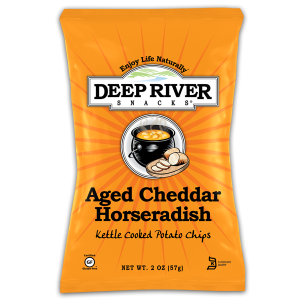 Recently updated packaging has seen Deep River keep their traditional logo, while also retaining their star-burst color contrast and the graphic kettle and sliced potato. What they have changed is the main bag color - each different flavor has a bold and striking color packet which will stand out on the shelves.This flavor has a nice bright orange bag (should the Chips have been made from sweet potato?) and as for that flavor, well that's the selling point - what could they taste like? It is time the pot and potato graphic went though. Maybe because of the copious amount of seasoning, but these did not seem quite as crisp as some Deep River Chips. They were however just as crunchy. Thick and firm Chips that resisted the bite. It doesn't get much better. As usual with Deep River Snacks, the Chips are invariably medium sized, curly, sometimes even bent in two, firm and rigid - with oil bubbles that remain intact, such is the thickness of the potato slice. These were a sort of golden orange yellow color, with lots of cheesy seasoning powder on them. This managed to coat fingers without the aid of grease, which is always a plus with Kettle Cooked Chips. Somehow the science boffin geniuses that toil over boiling pots of ingredients to bring us the World's favorite snack food, have managed to turn some Scrabble word style ingredients, plus Onion Powder, Paprika, and a variety of Cheese flavorings into this combo. We can see how they got the cheese flavoring - it says Cheese flavorings! But the horseradish? And there was horseradish. Lots of it. The taste was undeniable. If there was any cheese it seemed somewhat overpowered. Horseradish is traditionally served with beef. It is as spicy as most peppers and leans more towards Wasabi. Our Taste Test would say this is Deep River Snacks hottest Chip, but it says it's a combo and on that front it falls down.